June's Month of Softies theme was the perfect excuse for me to crochet-up this little guy! His name is Supa' Fly and I made his wings and eyeball with size 8 perle cotton from DMC and size 8 hand-dyed Artfabrik thread. Incidentally, I've been buying Artfabrik thread for a while now and I LOVE Laura's colorways. All of her threads and fabrics are hand-dyed and the color quality is always consistent. Good stuff. Supa' Fly's body is made with a novelty yarn that I bought while in New Orleans (I LOVE N'awlins - one of my most favorite cities in the US) about three years ago. So, I was effectively doing a little stash-busting too. 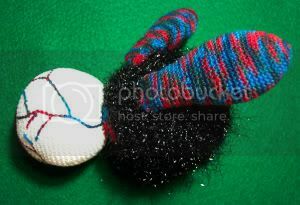 I plan on crocheting Supa' Fly's counterpart too...Flattened Fly! I know, I know, twisted. Copyright 2005 Regina Rioux Gonzalez. All rights reserved. You're a thoroughly evil woman. LOL. Hope you're going to edit those pics down some. It took FOREVER for them to load. If it was anybody else, I wouldn't have waited. What?! Supa' Fly ain't gonna have him a Fly Girl?! I gotta get me some of that thread! I never thought I'd say this, but that's one cute fly! Holy Crap I LOVE HIM.....Can't wait to see whats escaping from your head next time! do you take requests? How 'bout Buzzbee Berkely? 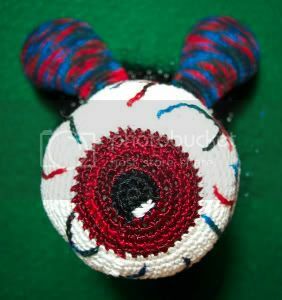 What a great surveillance fly - the ultimate 'Big Brother is watching you' eyeball. Glad you liked the childish fantasy wardrobe - thanks for the comment. ROFLMAO woman! That is HILARIOUS! Hey... he looks like the guy buzzin' 'round my window! Fabulous June Bug! I am never disappointed when I stop by. supa fly is amazing! talent in those twisted hands, girl!!! Sara I was thinking about making a bee too...now, a devil/hick bee I'd not thought of...LOL. Mom, driver ants might be cool too. Hmmmm...a whole new LL line of insects. There are possibilities there. That is SO cool! You rock! Your creativity is inspiring!! That is seriously disturbing. I think I love it. OK I just have to say I am so looking forward to Flattened Fly!!! I have spent the past few days battling flies that swarm in every time someone opens the door! 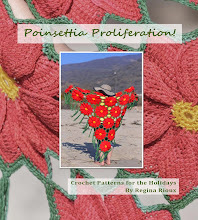 Got to you here via your Crochetville post---this is hysterical! I Checked out the Softies page which only seems to go up to the April theme announcement; how did you find out about the June theme (and what, exactly is it)? This is the kind of tickle I need to think more outside my usual frame. Ohhh... can't wait to see flattened fly. Supa'Fly is much fun! 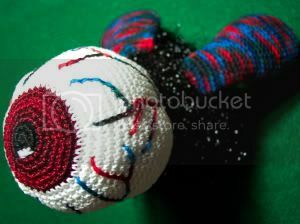 My mother in law sent me your link because she knows I collect eyeballs and I am a crafter. I suppose I have to learn how to crochet now too! 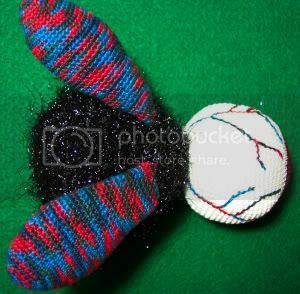 Hillbilly Knittin' is NOT just for girls!